Katherina Thoma not unreasonably chooses to set her 2013 Glyndebourne production of Ariadne auf Naxos in a country house in the south of England (though I suppose equating the Christies with a rather boorish Viennese bourgeois might be thought a touch unkind). She also chooses to set it in 1940 which sets us up for an almost Marxian dialectic not just between high art and low art but between art and life; especially where life and death are concerned. The opera proper isn’t. Instead we are back in the same space some months later after it has been converted to a hospital. Both the PTSD’d composer and the suicidal Ariadne are patients alomg with an assortment of others. 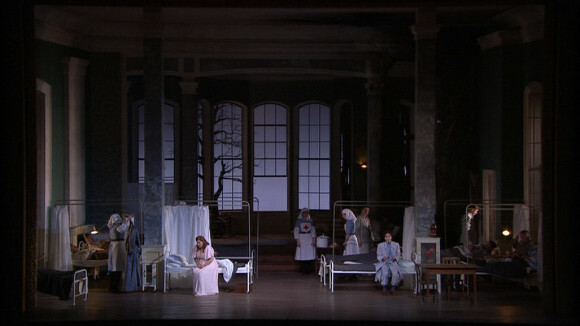 The nymphs are nurses; exceptionally well sung and acted by Ana Maria Labin, Adriana Di Paolo and Gabriela Istoc. Zerbinetta and the gang arrive as an ENSA troupe. It works. 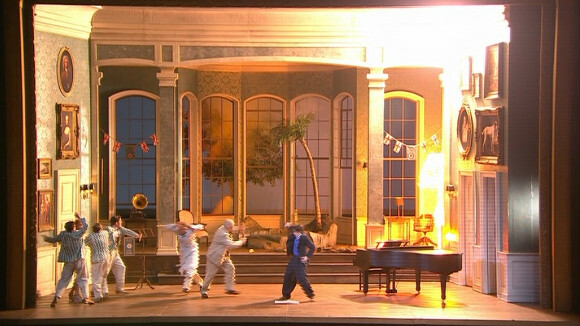 Ariadne’s disorientation and despair seem more genuine than in an opera seria setting. The troupe’s attempt to cheer people up seems fitting. Zerbinetta’s flirtatious antics are probably exactly what any patient stuck in a military hospital would have dreamed of. Es gibt ein Reich is spine tingling with Ariadne breaking into the medicine cabinet for poison, only for it to be snatched away on “release my soul” which turns the rest of the aria, convincingly into a plea for the composer to give her the poison rather than something abstractly philosophical. 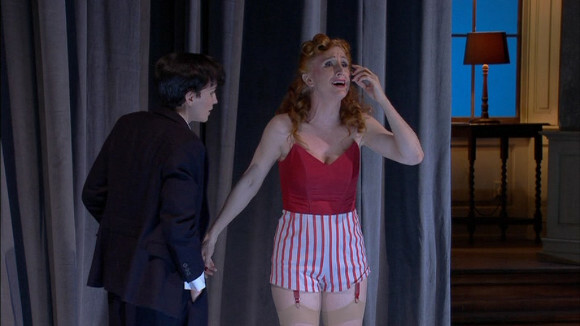 Großmächtige Prinzessin is more sexually charged than even Natalie Dessay manages. Here Zerbinetta ends up in a strait jacket as the nurses try to subdue her sexual frenzy. 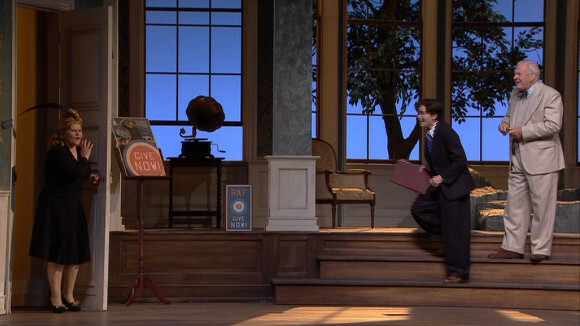 How Claycomb manages to sing at all, let alone brilliantly, while acting so intensely is a bit of a mystery. The boys return disguised as nurses to try to spring her and more highly sexualized escapades follow. It’s very funny but also quite disturbing. Bacchus almost literally parachutes in. He’s an injured fighter pilot and both he and Ariadne are totally confused about who they are and who the other is. I’m not sure they ever quite resolve that but they clearly fall for each other hard. It’s a pretty reasonable way to wrap the concept up. A not inconsiderable bonus is that Sergey Shorokhodov is far the most lyrical Bacchus I’ve heard plus a really good actor. Throughout, Vladimir Jurowski makes his small band sound intimate, sprightly and grand as appropriate. The sets and costumes deserve a special mention. Julia Muer and Irina Bartels have the look and feel of an English country house in wartime just right. 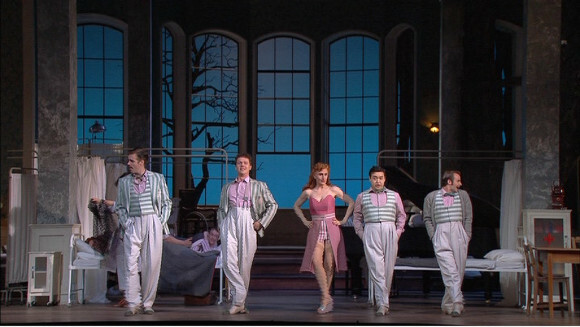 Even the uniforms are pretty much correct, which never seems to happen in opera. I can’t vouch for the authenticity of Ms. Claycomb’s outfit but it does reveal a lot of thigh. Olaf Winter’s lighting is rather excellent too. François Roussillon directs the film. It’s a pretty decent job; clean and unfussy. There are times when I wished we could see more of what was going on upstage but it’s not as bad that way as most videos. The DTS 5.1 sound and picture (from an HD source) look and sound perfectly fine on DVD. I’d be curious to see if Blu-ray is a significant improvement. The extras on the disk reveal a deeply intelligent and committed cast and creative team. Well worth a look. The booklet also has a good Q and A with Thoma and a misleadingly conventional synopsis. Subtitle options are English, French, German and Korean. So, a thought-provoking and essentially convincing treatment brought to life by a truly first-rate cast. 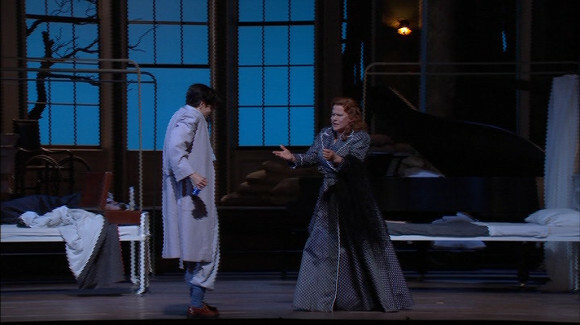 There are a lot of good and very different video recordings of this opera in the catalogue and I wouldn’t want to have to pick only one. if I did, this would be on the short list. This entry was posted in DVD review and tagged allen, claycomb, di paolo, dvd, glyndebourne, isokoski, istoc, jurowski, labin, lindsey, lpo, muer.bartels, roussillon, skorohodov, strauss, thoma, winter by operaramblings. Bookmark the permalink. I always wondered why it got so many bad reviews at the time. There are a few thoughts about that on Laura Claycomb’s blog. Part of the problem may have been that the audience wasn’t prepped at all. The synopsis in the program apparently was just the regular plot which won’t have helped much. Then there’s the surtitles. If they were the same as the ones used as subtitles on the DVD then there is room for confusion as they are a long way from a literal translation. I rather like the breezy 1940s English but it was not von Hofmansthaal. Hm, poor advertising then… But what do you mean when you say it wasn’t Hofmannsthal? The subs were changed for the setting. For example, Bacchus was raised by nurses not nymphs. But that’s all detail… Anyway, at least it’s got a DVD life after its run.